My friends and I played as a sixsome on Thursday afternoon. We played eighteen holes in three and a half hours, and kept ahead of a cluster of high-school matches behind us. The game was T-Bone, and on the final six holes–during which all six balls counted–my team came back from far behind to halve the match and win two presses. We won four dollars apiece. Why is it everyone THINKS they play fast when they really don’t? I’ve gotten so seized up on playing fast that the least dawdling by my playing partners drives me batty. When you play in some of your fivesomes at your blistering paces—how have you gotten everyone to buy into the idea of such fast play? It’s funny—our club is always struggling to get members. I went so far as suggesting to our Manager that the club institute a 3:45 time limit on rounds and then aggressively market that fact. In a world in which you are trying to differentiate yourself in the marketplace—if I found a course that I KNEW I would get my round done in less than four hours it would be a win/win for everyone. Do we just take every swing too seriously? When we played Crail Balcomie, in Scotland, it was awesome to watch all the local folks (including senior men and women) pulling their trolleys. They would just hustle up to their ball, yank out a club, hit, watch for about three seconds, stuff their club back into the bag, and get gone. That would be great to see here. Thanks for letting me vent. Pace of play ought to be a burning issue for every golfer, because the slower golf gets the more golfers will quit, and the more golfers quit the more expensive and annoying the game will become. And if it’s the speedy players who give up and go away we’ll be left with nothing but slowpokes. I personally don’t think nine-hole rounds are the answer, since a two-and-a-half-hour nine is every bit as aggravating as a five-hour eighteen. Time’s a-wastin’! 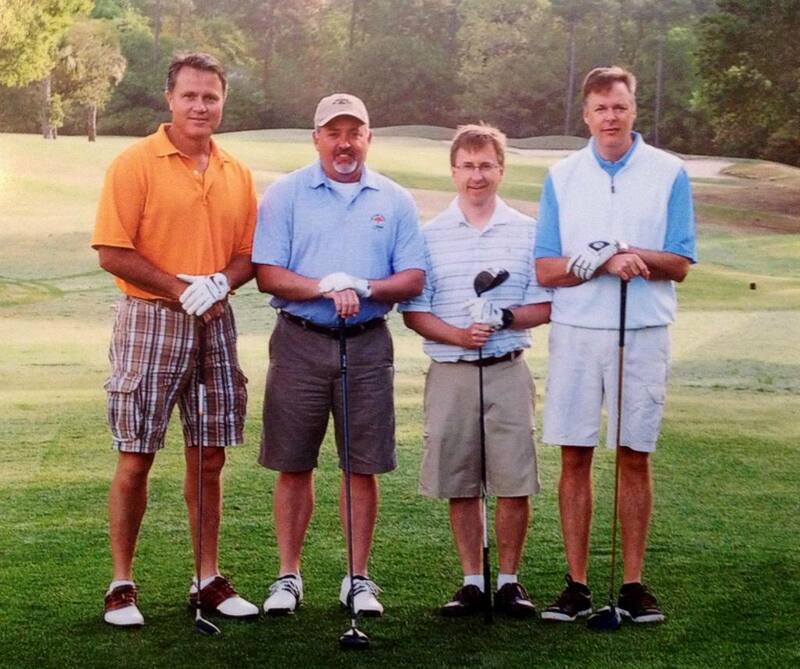 Kent Manning and his regular, non-slowpoke foursome. Kent is the guy holding his club upside down–“kind of a microcosm of my game, actually.” This photo proves, incidentally, that middle-aged golf buddies are 100 percent interchangeable. This entry was posted in Games, Two-Hour Eighteen™ by David Owen. Bookmark the permalink. Golf here in Korea puts a new meaning to the word slow, but I suppose when you’re spending upwards of $200 every round, there’s a lot of pressure to stretch it out and make an event of it. Worst part of it for me is the near mandatory 30 minute break between 9s to have a meal. Drives me crazy to get thrown off my rythm like that. Of course the courses here have stadium lights allowing for night golf, so that makes up for it somewhat. I really feel like when everything but the fairway is blacked out, you are that much more likely to hit it. Cory: Send photos! Send a trip report! Tell us about golf in Korea! And about yourself! If you’re willing, send to: myusualgame@gmail.com. Competitive golfers should be penalized a stroke per minute for being over the time par of the course, with the maximum at four hours. At the professional level, the strokes would be equivalent to fines. Our forebears played almost two rounds in the time in takes most to play one now. A friend and I played in three hours yesterday morning while walking and playing terribly; even many extra strokes for both of us didn’t slow us too much. Didn’t rush a bit. In the early years of the Masters, players were expected to finish in three hours, and even in the nineteen-seventies three and a half hours was considered borderline acceptable. In 1956, George Sargent, an English professional, complained in a letter that he and his partner had been told on the ninth green to hurry up, even though they had played the first nine in an hour and a half. Clifford Roberts, the chairman of the club and the tournament, apologized for the warning, which he said had been inappropriate, and explained that the problem had been with other players. He added, “Taking four hours to play a golf course in as good condition as the Augusta National . . . is inexcusable. If this becomes a regular practice at Augusta I am quite certain that we will lose a lot of our patronage and this means, of course, smaller prizes for the Players.” For many years, lagging players were told to step aside and let faster ones play through. A big part of the problem that I have observed is players trying to observe “golf etiquette”. I played a painfully slow round yesterday with a pair of strangers who insisted on staying behind the ball of the player who was away, waiting until he played his shot, admiring it and complimenting the other player, and then going to his ball, selecting a club, etc. I certainly understand staying behind the other player’s ball when it is on the same line as yours, but when they are on opposite sides of the fairway, you should be standing over your ball with a club in your hand ready to play your shot. And if the other player is slow to play his, don’t wait for him. Rory Sabbatini was my hero when he finally had enough and walked to the green while Ben Crane took forever to play his approach shot. It’s just infuriating to wait for people who want to play like it’s the US Open. I could go on with more examples, but you get the idea. When I play with friends, the balls aren’t quite in flight simultaneously, but it’s close. My advice is to play like you are alone unless it is unsafe to do so. If I pay $300.00 to play Whistling Straits, I don’t want to be put on the clock. I paid good money for the once in a lifetime experience. Some players are in a big hurry because they have to be somewhere after the round. This is always going to cause problems. The pros HAVE to understand that they must play faster so that the tournament will finish during the allotted TV coverage. If the finish is not on TV the game will suffer. The comment about 9th hole hot dogs is right on. The ninth hole stop really screws everything up. Putting emphasis on playing nine holes is a great idea which will help golf grow. Letting others play thru is one of the best ways to solve the slow play problem. More courses should hire rangers and those rangers should move people around as they see fit. Slow play is causing violent arguments on what used to be a serene place – the golf course. This is a way bigger problem than folks realize. Last weekend, I was in LA for a meeting and had a free Saturday afternoon before my flight home. I decided to play a scenic un-named course near LA (oh, what the hell – it was Los Verdes in PV). I teed off at 2:10. At 6:15, I had to walk off the course while waiting on the 11th tee (we were the 3rd group waiting on that tee). 4 hours to play 10 holes and I was told that the back nine was the slow side. My playing partners were worried that they’d get all 18 in before dark! I too want my weekend rounds faster and am damned tired of the course super thinking he’s setting-up for the US Open; high first cut rough, inaccessible pins, and god forbid its a little wet and cart path only! Players can speed things up; play faster, be ready to hit, especially be ready to putt, and play appropriate tees for abilities. But the courses can help with better set-ups as well. I completely agree about golf course design. High rough on a busy course is just STUPID! Don’t blame me if I’m a little slow because this 5 handicapper hits it crooked from time to time and I barely miss the fairway and it takes me 4 minutes just to find my ball. C’mon man! Why pace of play talk is just that. From the mobile web site of harborshores golf, newer Nicklaus signature course in mi. The expected pace of play is 4.5 to 5.5 hrs!!!! Sounds fun. At my course in North Salem NY, they promote 4:15 as an acceptable time for 18 holes..Now they are ready to propose that 4:45 is ok for 18 if you are playing in a tournament..What a joke!!! we have a # of groups who play in 3:30. and most about 4-4;10..Why tell them it’s ok to play even slower? It’s like bizarro world..Your going the wrong way! Most of our members have played the course hundreds of times, What shot haven’t they seen before? Had the exact same problem then. No doubt there is a correlation between time and golf course length (just more distance to cover, not to mention longer holes). I suspect the longer equipment is also an issue. I find it a lot easier to find 150 yd shots than 225. The guy’s going over 250, with insufficient control are hunting for a ball on every hole. I’d like to see the 10:00 weekend groups take in the back tees as they go by. I find walking helps, everybody goes to their ball. The cart pairs most often play each ball sequentially. Caddies would help, but of course drive up the cost. Of course the slowest group on the course is the four twenty somethings in carts, putting away a twelve pack or more. How about limiting the alcohol to the 19th hole? With a 3.5 hour round, there’d be plenty of time for a group pitcher and still get home for chores.